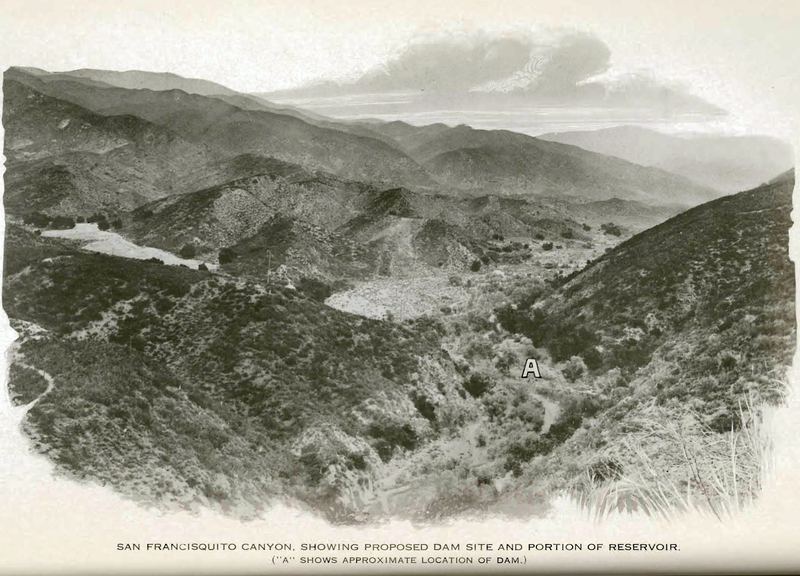 SCVHistory.com | L.A. Aqueduct | L.A. Board of Public Service Commissioners Annual Report, 6-30-1923. 22nd Annual Report of the Board of Public Service Commissioners. Reginaldo F. del Valle, President. For the Fiscal Year Ending June 30, 1923. Los Angeles, Cal., July 15, 1923. To the Honorable, the Council of the City of Los Angeles. 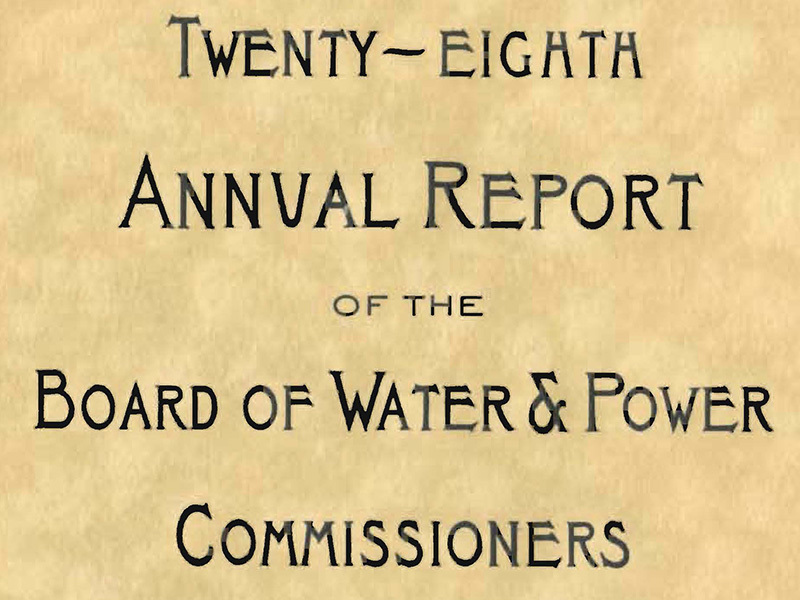 The Board of Public Service Commissioners herewith respectively submits its Twenty-second Annual Report, for the fiscal year ending June 30, 1923. During the year the Board lost by death, one of its esteemed members, Mr. A.G. Bartlett, and Mr. John A. Burton was appointed as his successor. As is well known, the great activities of the City of Los Angeles, in all branches, have been steadily increasing, and it has been some problem for the Public Service Department to keep up with the demands for water, power and light, made upon it. It is believed, however, that a study of the attached reports of the heads of departments, in the Bureau of Water Works and Supply and Bureau of Power and Light, will be convincing as to the immense progress made, even during a year of unparalleled growth of the City. In reviewing the work accomplished by the Bureau of Water Works and Supply as set forth by the report of the Chief Engineer, particular attention is called to the extraordinary growth of the City for the past several years and this condition has not only been maintained but has been actually accelerated during the year just closed. This fact is best illustrated by the following comparisons. Services installed this year for domestic purposes amounted to 20,568, as compared with 16,759 for the previous year or an increase of 28.7 per cent while there were 207.72 miles of mains laid as against 116.54 miles for the preceding year or an increase of approximately 80 per cent. Applying the ratio of 4.8 inhabitants per service, this would indicate an increase in population of approximately 100,000 people. Work was continued throughout the year on the Stone Canyon Dam, 253,900 cubic yards of earth having been placed during this period. The same condition was true at Encino Reservoir where 182,700 cubic yards of material were placed in the structure. The surveys for the Weid Canyon Reservoir site have been completed and the work on the stripping of the dam site is well under way. The road from Cahuenga Pass into the camp and gravel and concrete bins has been completed. Detailed surveys of the new St. Francis Reservoir site have been completed. This reservoir site is located approximately one mile north of the lower San Francisquito Power Plant and will provide a storage of 30,000 acre feet. Numerous trunk lines have been constructed, the most important of which is the York Boulevard Trunk Line from the new Riverside Drive Pumping Plant to Highland Reservoir. This line is 24 inches in diameter and will take care of the permanent supply into the Highland Park and Garvanza Section as well as providing the necessary supply to take care of the recently annexed City of Eagle Rock. Several new installations have been made in the various pumping plants in order to keep pace with the increased demand in the sections they supply. Emphasis is laid upon the water supply situation for the City as a whole, and the Chief Engineer has been carrying on investigations with the idea of providing a water supply far in excess of that in the City at the present time. These facts, as called attention to, will be revealed to the general public when sufficient data has been amassed in order to lay the matter before the city in a concrete form. Attention is called to the stress imposed upon this Department due to the enormous growth of the City, both in population and industry. This fact brings forth the necessity of many important betterments that are at the present time under consideration and are outlined in the Budget for which it will be necessary to provide funds, by a further bond issue or by other means to enable this work to be performed. The period covered by this report is the first full year of the operation by the Department of the electric distribution system acquired by purchase from the Southern California Edison Company. From a careful scrutiny of the operations of the Bureau of Power and Light, as set forth in the reports of the Chief Electrical Engineer and his assistants, it will be seen that the City of Los Angeles has not only realized a very substantial surplus as a municipal corporation from such operations, but also that the people as rate payers have realized an enormous saving in the amount paid for electric service by reason of the existence of the municipal electric system. In such reports there are also fully set forth the facts concerning the great increase in the demand for electric energy for all purposes resulting from the amazing residential, commercial and industrial growth of the city. The problem of meeting this demand, which is rapidly becoming a serious problem, by providing the necessary additions and betterments to the distribution system and also by providing additional generating plants as sources of power supply is ably dealt with by the Chief Electrical Engineer. The reports of his Assistants make an interesting detailed showing of the work accomplished by the several Divisions of the Bureau of Power and Light during the year. Again, the Board wishes to express its appreciation of the faithful co-operation, and efficient service of employees and heads of departments under its control. BOARD OF PUBLIC SERVICE COMMISSIONERS OF THE CITY OF LOS ANGELES. By R.F. DEL VALLE, President.